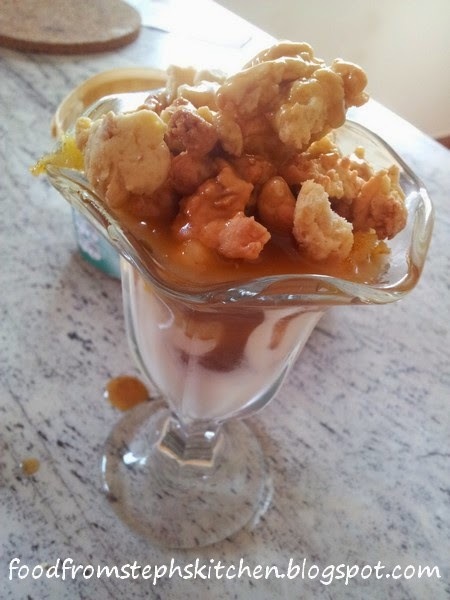 This sundae is simple and most of the elements in it can be done ahead of time. It's great if you have kids (or big kids) and something a little different for guests. 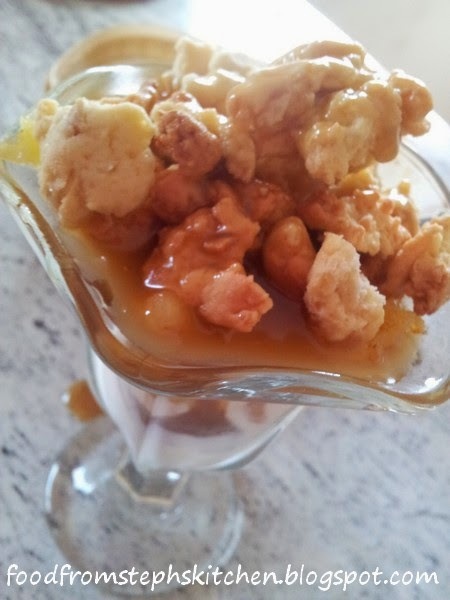 If you aren't obsessed with caramel like I am chocolate sauce would go just as good. I choose to do bananas in mine as they have been amazing recently, but spiced apples would also be good with the caramel sauce. Any sort of berry would be the perfect match for the chocolate version. The cookie bits are the best part - and what is really great is you can make the cookie bits by themselves and keep them in an airtight container, simply sprinkling over icecream ... no, I'm not a comfort eater at all! Essentially you are making cookie dough for this bit, and instead of rolling into balls you will be crumbling it onto the cookie tray. Cream the butter, sugar and egg until the mixture looks smooth and fluffy. Add your crushed peanuts and mix through. If you don't have crushed peanuts simply smash up some whole ones by placing them in a zip lock bag and smashing them gently (so not to break the bag) with something with a bit of weight. Shift the flour and add it to the mixture half a cup at a time; you may have to use your fingers towards the end. Now the fun part - line a baking tray with baking paper and crumble the cookie mixture over the top. You can make them as little or as bit as you like. Alternatively you can always bake them as cookies and simple blitz some up in the food processor later on - but personally I like crumbling! Bake in a moderate oven for around 10-15 mins or until the cookie bits have a little colour. Pop them aside to cool. If you're making them the day before keep them in an airtight container. Cut up your bananas in half, then each half into three. If the pieces are too small they could mush in this next part - but that's ok too! Melt the butter and fry off the banana until it has a little colour. Now the fun part - the assembly!!! Add the ice cream to the bottom, followed by the banana and cookie bits. 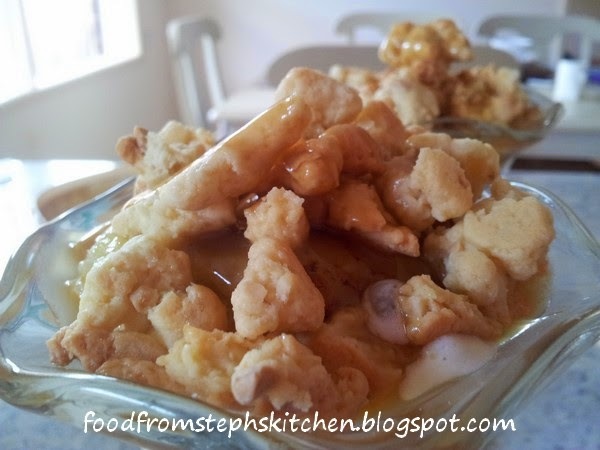 Finally pour the butterscotch over the top ... and enjoy!